Distinguish, differentiate, compare and explain what is the difference between Skimming and Scanning with examples and exercises. Comparison and Differences. Skimming and scanning helps you to find information easily and quickly. It is a really useful skill to have and will help you answer comprehension questions. Skimming is when you read through a piece of writing quickly to see what it is about. Scanning is when you scan the page with your eyes to find answers to questions. 1. 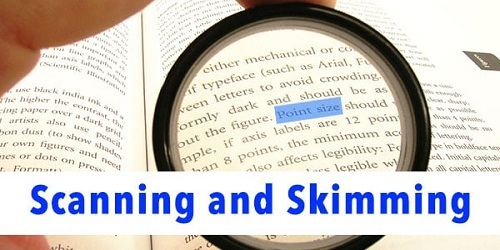 In reading, Skimming is the practice of moving eyes over text quickly to get an overview and main ideas of the text. In reading, scanning is the practice of reading texts very quickly to find a particular piece of information. 2. Skimming is reading a text quickly to find out the general theme, topic or meaning. Scanning is reading a text quickly in order to find specific Information e.g. figures or names. 3. Skimming is useful for pre-reading tasks or texts that don’t need a lot of detailed attention. Scanning is useful for answering exam type questions which ask for True / False or to discover facts etc. 4. In skimming, there is no need to read every word. In scanning, the objective is to search out relevant words, collocations etc. 5. Skimming focus is on improving speed of reading. Scanning focus is more on !axis than general meaning and to ignore Irrelevant information. Explain how is Skimming done with examples? When seeking specific information related to a topic/theme or an answer to a question or a prompt, it is best to employ skimming. The skill of skimming allows for you to read the headings, titles, subheadings and illustrations with captions, as well as reading the first and last paragraph of a text/article. Indeed, skimming works well to identify dates, names, places or specific items. It also allows for the reader to quickly review charts, tables and graphs. Explain how is Scanning done with examples? When a student is asked to employ scanning in a task, this process involves moving the eyes quickly through the text (or down a page) looking for specific words and/or phrases. Scanning can also be used in a research project, where the student can scan the text to determine whether it will provide the information he/she is looking for. It is important to note, once you have scanned a text, you might go back and skim the text to identify the main ideas.